On Wednesday, November 21, the Dakota Christian Student Council held a Thanksgiving lunch in the gymnasium.We served a wide variety of things: including chicken noodle, chili, and broccoli soup. We also served buns, cookies, and coffee.The Student Council served around 200 people on Wednesday. We had multiple groups singing songs of thanks and giving God the praise for all He has blessed us with. America is country built on the free market. The free market has allowed massive amounts of cash to flow into our country. This has made the average American richer than 99% of the world. We celebrate all that we have on Thanksgiving. Ironically, the very next day, people are beating each other up just to get a flat screen TV at half price. This is not to say that Black Friday itself is a bad thing. It merely shows how ungrateful many Americans are. I’m not saying that we should get rid of Black Friday, or the newly established Cyber Monday. However, we, as Americans, need to see that Thanksgiving is more than just a longer weekend or a great time to get the next best thing at a cheaper price. It is a time to be thankful for what we have, and to show our gratitude through our giving to the less fortunate. This weekend most people traveled across the states for Thanksgiving. Everyone has something to be thankful for. Because we live in America, we can travel to our grandparents’, cousins’, or even friends’ houses for the weekend. This past weekend was dedicated to everything we are thankful for. Sometimes we forget to be thankful during this time and are just all about the food and hanging out with our favorite cousins. We have so many more things to be thankful for in our everyday lives. On Tuesday, November 13 the DCS Junior class had to take the ASVAB test. This test is held by the South Dakota Army National Guard. This test consisted of: Word Knowledge, Paragraph Comprehension, Arithmetic Reasoning, Mathematical Knowledge, General Science, Mechanical Comprehension, Electronics Information, Assembling Objects, and Auto and Shop Information. This test is suppose to help people decide on their future. In addition, this test can benefit you if you wanted to go into the Guard. On November 9, Dakota Christian held a veterans program in the gym. We had the honor of having the K-12 sing beautiful songs, paying respect to our veterans, and praising God. Us members of Dakota Christian would like to thank all of our veterans who served and the ones still serving today. On the ninth of November 2018, Vonda stepped aside from her signature Italian style and went with an all-American dish. This dish being chicken nuggets. These little chunks of fine poultry were chopped in exemplary proportions. Any thicker and the center would be cold; any thinner and the nugget would be overdone. Fortunately, the Dakota Christian student body had Vonda and her skilled helpers in the kitchen. Of course, chicken nuggets would not be complete without a complimentary sauce bar, or so thought Vonda. She whipped up three different signature sauces for the nuggets. Last Saturday, November 3, 2018 Dakota Christian High School hosted the Fall Fling Craft Fair. According to my sources, the food included chicken noodle soup and cheeseburger soup. Apparently, the soups were delectable. The variety of vendors was immense. From a bake sale, ice cream, tupperware, jewelry, clothing, makeup, to give a few; there wasn’t something you couldn’t find. In total, DCS raised more than $6,000, and more than 400 people visited. On the 22nd of October 2018, Vonda made it clear that she was a fan of Italian cuisine. It was on this day that her and the ladies made an elegant loaf of stromboli. Inside of the glazed golden shell, rested a hot mess of the essential elements of all Italian meals: molten mozzarella, spicy pepperoni, and signature sauce. Soon, this shell would quickly realize how formidable fate was as an enemy because, much like how the shell imprisoned those delicious ingredients, it would soon be imprisoned by the stomachs of the children of Dakota Christian School. For the past several weeks, the media has been talking about a caravan of “refugees” coming up through Mexico towards the southern border. The politicians have offered a wide variety of solutions towards the caravan. Many democrats (and some republicans) have been saying that these people are coming here looking for a better life and should be allowed access to our country. On the other hand, many republicans (and maybe some democrats) have been saying that the the caravan is full of criminals and gang members and should never be allowed to come in. This situation has turned into a battleground for many politicians running for office. America is indeed a country of immigrants, and I continue to believe that immigration is super important for our country. However, I don’t support letting tens of thousands of illegal immigrants in the country. Our ancestors didn’t just jump on a boat and come to America and expect to be given stuff. They had to have papers that would prove where we were going and who or what company sent us. I’m sure that some of the people in the caravan are just people looking for a better life. I am also sure that some are criminals and gang members and should never be allowed near America. All I’m trying to say is that there is a process. We don’t award people for breaking any other laws. I don’t see why illegal immigration should be treated any differently. On October 28, the Dakota Christian School hosted the Reformation Service in the gym. We had a pretty good turn out. The DCS high school choir sang two songs. We had the privilege to have Pastor Gary Mulder preaching the service. He gave a very good sermon about the Reformation. Nearly everyone has had to go through the ACTs or the SATs. These tests have been used for many years to determine intellect in students. While the main focus of these tests are to see how intelligent the student is, standardized tests also can tell how well a teacher does his or her job. A question has arisen in recent years about standardized testing though. People have begun to question how well standardized tests measure a student’s ability. It is no secret that some students do great on the homework and then fail the test or vice versa. It is because of this question that some have questioned the usefulness of the test. I think that these tests are extremely useful. They give colleges a general knowledge of what you know. They also influence what jobs you can and can’t get. You are also given multiple opportunities to do good on the test. We should keep using these tests because it gives an accurate assessment of how intelligent the student is. In a modern electronic-based world, more and more things in life are becoming computerized. With everything being consumed by electronic technology, programmers are becoming far more in demand. What most people don’t realize is that most programmers are bilingual. This second language is the language of the computers that now run our world, code. Coding is a very complex language that is essential to all computer programs. Without code, all these electronics would simply have no purpose. A robot without code would be dormant. A website without code would be blank. A phone without code would be quiet. When there’s demand, there’s profit. For as many electronic devices as there are out there, there needs to be about as many programmers. Think about how much you see modern electronics in your everyday life. Somebody programmed all of that. Somebody wrote in this separate language, and told that electronic what to do. Our world would be a dark place if it weren’t for these programmers. On Thursday, October 11th, Rachelle and her team crafted an Italian cuisine, otherwise known as spaghetti and meatballs. The ductile strips of spaghetti were prepared in a manner that resembled the pinnacle of pasta. However, what is spaghetti without sauce of equal measure? Fortunately, the sauce was, if not equal measure, beyond that of the pasta. The paste was accompanied by brilliant herbs and spices that cooperated with the sauce in a symbiotic connection. To top it all off, the chefs distributed handcrafted meatballs. These balls of meat were of the plump physique and perfectly spherical. Needless to say, the children of Dakota Christian School were satisfied upon exiting the cafeteria last Thursday. On Tuesday, October 2nd, Dakota Christian School hosted a parade, orchestrated by the band teacher, Karissa De Jager. The lineup was as follows: Parker leading the colors which were represented by preschoolers and kindergarteners of DC; governor candidates, Jeremy Boer and Joey Maas; DCS royalty king and queen, Jared Peters and Kaycia Hettver followed by candidates Vonda Schulte, Jenna Masur, Chris Dykshorn, and Harv Hofstee; the Shriners; the herd of bikes; the DCS band to finish. Not only after, but also prior were pancakes served to those who chose to come. For the third volume of Lunch Language, Vonda and the chefs of Dakota Christian School dominated the lunch hour with yet another deluxe meal. On the 17th of September, they made calzones. These calzones were, as always, cooked to perfection: golden-brown and glistening with a nice thin layer of butter. All of this was topped with a diverse blend of herbs. However, when it comes to calzones, what matters is what’s on the inside. Upon opening this fragile treasure chest, luscious cheese and various Italian toppings came flooding out. Administration: The administrative responsibilities have been divided between a CEO and a Head Teacher. Mr. Boer, acting as CEO, teaches in the morning and performs his administrative duties during the afternoon. He maintains a supportive Christian environment for all personnel, students, and constituents, keeps abreast of current State and Federal Statutes, maintains student and personnel records, meets with the board monthly, as well as numerous other duties. Mrs. Veurink works half time in the morning as Head Teacher and Counselor. She makes regular classroom visits and reviews lesson plans, ensures that DCS maintains the new South Dakota requirements for graduation, and administers standardized testing. Both Mr. Boer and Mrs. Veurink report that this arrangement has made it possible to tend to their responsibilities more efficiently. Security: A new security system will be completely funded through a federal grant and will be installed soon. Doors will remain locked during the school day but you can be let in through the front door by “buzzing” the office staff. We are very grateful to Mr. Mitchell for applying for this grant. Music: Our band, under the direction of our talented director Mrs. De Jager, has been practicing its marching skills and some special effects. These will be displayed at special upcoming events including the River City Band Festival in Chamberlain on September 28 at 12:30. Dordt Pheasant Hunt: This project has become an integral part of our financial support, raising a total of $211,147.55 in the last decade. To become involved in the pheasant hunt this year or supply additional hunting opportunities, please contact Randy Niewenhuis (946-5095). Website Contributions: You can now provide financial assistance through a link on our website. Specific needs will be highlighted as well as an opportunity to provide general support. (support DCS here) For more information, please contact one of the board members. Thanksgiving and Prayers: We are thankful for a dedicated faculty and staff. We are blessed to have a team of Christians committed to providing a positive learning environment for our students. We are also very thankful for the many volunteers and donors who work together to assist our staff and students. You are a very important part of our Christian school community. Please continue to pray for Dakota Christian School. We desire God’s wisdom as we work together to fulfill our mission to “assist parents by providing education based on a biblical worldview, thereby enabling their children to grow in Christian wisdom, to nurture godly character, and to serve Christ as Lord." On Tuesday 11, September 2018, Vonda and the ladies held up the starving children of Dakota Christian with some fantastic Indian Tacos. The wonderfully crisp fry bread shells made the perfect base for the flavorful ground beef taco meat. As always, a hand-crafted salad bar that made for exceptional toppings for the Indian Tacos was laid out. On Thursday 13, September 2018, Rachelle and her crew made an elegant lasagna. The noodle to sauce ratio couldn’t have been more on par. The garlic toast was cooked to a nice bronze and layered with a nice sheet of butter. A more fitting duo could not have been formed. Seventeen years ago, the nation of America woke up to a day that will forever live in infamy. Four passenger jets had been hijacked by terrorists and had struck the Twin Towers, the Pentagon, and a field in Pennsylvania. America could only watch, helpless, while the Twin Towers and Pentagon billowed smoke and flames. When the smoke cleared, nearly 3000 people had died. Even now, years later, we can still feel the aftershocks of that terrible day. At the end of it all, America emerged united and stronger than ever before. Because that is what we do as Americans, we overcome our obstacles and always win. I personally have always admired the first responders who ran into the Twin Towers. They didn’t care about what happened to them. They only wanted to rescue as many people as possible. This what I think of when I think of America; defiant even while facing impossible odds. Dakota Christian Student Council put on a blood drive September 5. This year’s blood drive was bigger than those in the past. We were able to get the blood drive moved into the gym, instead of having it on the bus, like the past years because of the increase in numbers. Our total number of donors was 25 people. We are planning on hosting another blood drive this spring. We would like to thank the people who donated, we truly appreciate you taking the time to save a life. As you may or may not have known, the lunch program here at Dakota Christian is rather superb. With the head cook position being filled by Vonda Schulte, to expect anything less is absurd. On Tuesday, August 15, Vonda made beef stroganoff. The egg noodles were cooked to absolute perfection. The cream of mushroom and the ground beef topping were made to match the pasta in quality. On the 28th, Vonda made hamburgers and fries. The golden-browned French fries were warm to the touch and crisp to the teeth. Once again, the beef was cooked in a fashion that is equal to perfection. Of course, the burger wouldn’t be complete without the various condiments and toppings, which were arranged in Vonda’s topping bar. We students are more than excited to be returning to school and getting back in the rhythm. Our theme for this year is God is enough. God has gifted this school with two new teachers, Jared Peters, a math teacher, and Kaycia Hettver, the fifth and sixth grade teacher. The entire student body of Dakota Christian School went out to various locations to spread God’s love. For example, the Junior class went to Pete and Carol Sipma’s of Corsica. Together, the Junior class helped clean various things in and outside of the house. Needless to say, the Sipma’s were elated when the Juniors left. This week, I am going to give some highlights of my senior year. One of the best parts of the year was basketball season. I had my best year ever, and we had another season of going over .500. Another highlight would be my fourth year of All-State Choir. It’s awesome to sing with such a large group of fairly talented musicians. My favourite class throughout the year was Pre-Calculus, but I really enjoyed getting to know Mrs. Feenstra better through Personal Finance and Accounting (we had a lot of laughs). In British Literature, I loved reading the Hobbit because Mr. Boer gave us a reading schedule and all we had to do was take quizzes over what we read. Also, JRR Tolkien built a super complex world, and it was fun to explore a part of it. During the fourth quarter, Kendall and I had a lot of fun playing ping pong and taking up a new hobby, Hacky Sack. We played a lot in our shared study hall, and we have slowly progressed in our skill (Kendall is way better than me). These last few weeks of lax classes and teachers have been refreshing and fun, and I have enjoyed it while also looking forward to the end of school and my future education. It’s been a really good year, and I am a different person than when I started this year. I am certainly a better person than when I started high school. I am thankful that God is continually shaping me to be more like Christ and that He never lets me go. Now that the weather has warmed up, road construction has begun! Road construction can be dangerous and a nuisance. On the other hand, we should be thankful for the hard work these construction workers do in the heat. They have dangerous jobs and put in many hard hours. We all appreciate smooth roads to drive on. Right now they have been working on Hwy 44 from the Geddes corner to the Corsica corner. We hope that all of the workers and students traveling this road stay safe. The PGDCWLC Honkers have finally played a few baseball games. They are currently sitting 3-0, with wins against Gregory, Lead/Deadwood, and St. Thomas Moore. The best win we have had so far is against St. Thomas Moore, who always puts out a quality team. The real test comes this Wednesday, May 1; we travel to Winner to play the powerhouse Winner/Colome Royals. It’s a sprint of a regular season because the entire regular season of 10 games is being played in 16 days. We are definitely hoping for another state tournament birth and hopefully a top 3 finish! As our year is coming to a close we, the students of DCS, would like to thank all the teachers and staff members for all they do. These people make our school run smoothly and teach all the students of DCS. All the work they put in sometimes goes unseen, but we all do appreciate what they do and respect their authority. The Marvel Cinematic University, or MCU, is a series of superhero movies that are all interconnected. The MCU started in 2008 with the movie Iron Man, and the universe has included eighteen movies leading up to Infinity War. Some of the best movies in the Universe have included both of the Guardians of the Galaxy movies, Iron Man, Captain America Winter Soldier, and the first Avengers movie. Infinity War is by far the best movie in the series. It was the culmination of ten years and eighteen movies of work, and it had about a 300 million dollar budget. The villain was one of the best I have ever seen; the movie was a roller coaster ride of emotions, balancing serious, funny, and action almost perfectly. I would rate it either 9/10 or 10/10. It currently has a 9.1 on IMDB, which is the second highest all time. Infinity War is definitely a must-see. On April 20, Dakota Christian had their high school banquet. The theme for this year was Rustic Summer Nights. There was an addition to the program this year. For the first time in many years we were allowed to have a grand entrance. All the students attending, along with their dates, walked down from the stage to start off the open house. This was done so that all the students and their dates could be seen by the people. The banquet was a fun filled night with many great memories. The senior and junior Bible class is currently going through social problems. Each student was paired up into six totals pairs, and each had to choose a social problem to research. The pairs have to write a paper, make a poster and presentation, and invite a speaker to come talk to the class about the subject. So far, one speaker has come. Mr. Mitchell talked to the class about the separation of church and state. It certainly is a complex issue everyone needs to learn to think critically, truthfully, and objectively about. God created the government and church for a reason; they both have different jobs, but sometimes they overlap. Both extremes, a culture devoid of morality or a culture where everyone is forced into one religion, are both abysmal states to be in as a society. Much prayer, wisdom, and biblical discernment are needed for Christians to wisely navigate the waters of the issue of the separation of church and state. Easter is a wonderful time of year. The weather is warming and life is springing up all over; the church is normally full of people, you usually sing some different music than normal, and you get to share a great meal with family after church that you might not usually see. Easter is an enjoyable holiday, but there is a danger in it. The danger is making it the only time that you celebrate our Lord’s death and resurrection. We can often make Easter Sunday more “holy” than any other Sunday when the truth is, every Sunday is a celebration. Every week we get to go to church and celebrate our resurrected Lord with brothers and sisters in Christ. I hope that Christians don’t get caught up in making Easter too special and diminishing the rest of the Sundays in the year; make every Sunday a special, celebratory, restful day to appreciate that our sins have been forgiven because of Christ’s death and resurrection. The seniors went on their class trip over spring break. They left for Denver after school on March 14 and came home on March 19. The trip included serving food at a mission in downtown Denver, going to the zoo, attending a Denver Nuggets game, mini golfing, and hiking up Sugarloaf Mountain. On the way home, the windshield was shattered by a piece of ice. This turned into a three-hour delay in Denver before we could come home. This delay included walking around a suburb of Denver getting free Krispy Kreme doughnuts and buying books from Barnes and Noble, which was Luke Kaemingk’s favourite part of the trip. It was a great trip full of fun experiences and beautiful scenery, and the entire senior class is grateful for all the people who donated so we could have such a great trip. Mrs. Van Vuren, a substitute teacher here at DC, has started a ping pong tournament. Students and teachers are allowed to sign up to get in the bracket. The games are played during lunch break, or before or after school. Mrs. Van Vuren says there has only ever been one student that has beat her in a game of ping pong. Maybe this year there will be another. At DCS, British Literature is required for seniors. British Literature is taught by Mr. Boer. We are currently reading The Great Divorce by C.S. Lewis. A theme we have recently talked about is being consumed with something in and of itself. The example provided in the book is a painter who no longer paints to convey glimpses of heaven but paints for the sake of painting itself. This is an important concept to remember- that we should always be wary of our motivations for our actions. If you have a passion for writing, sports, music, art, or your work, do not forget whom you do it all for. Each action you take should be done for the glory of God- not for your own glory, and not just for the sake that you enjoy the action. Congratulations to these 1st-8th grade spelling bee winners. Students listed received 1st place and 2nd place respectively. 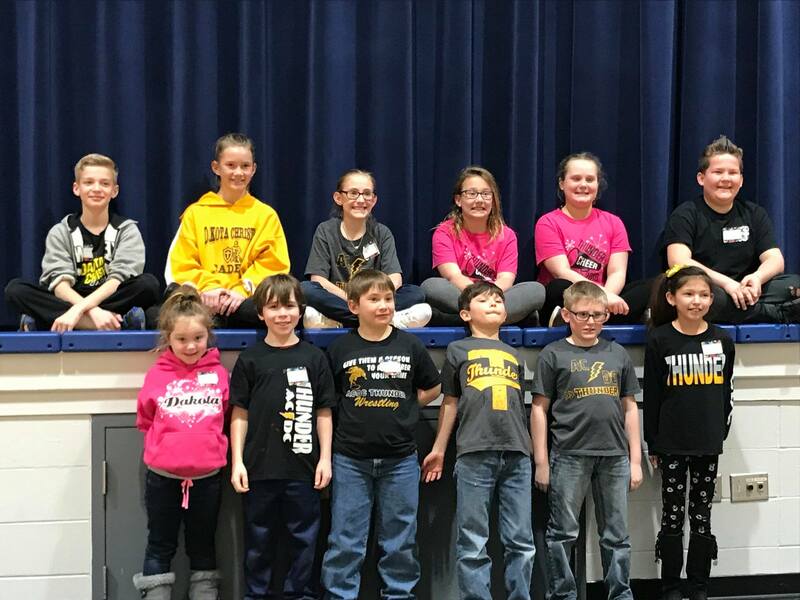 Both first and second place winners in grades 1-6 competed in the Missouri Valley Spelling Bee that was held in Boonsteel on Wednesday, February 28. The first place winners in grades 3-8 were eligible to compete in the Mitchell Corn Palace Spelling Bee, which was held on Saturday, January 27. The second place winners in grades 3-8 were the alternates. Maggie Backes placed 2nd in the 8th grade division and Mary Lou Siems placed 3rd in the 7th grade division. Congratulations ladies. The time has come for our schools to keep watch and be protected in a powerful way. Often times my mind wonders how easily someone off of the highway could just break in and wreak havoc. Many people may disagree but I am willing to stand out and say that a responsible teacher that is legal and willing to carry a gun should be allowed to carry a CONCEALED weapon during school. There are many legal processes and other precautions that need to take place for this to be allowed, so many that I don’t even want to begin to explain. These violent, outrageous, and crazy attacks need to stop. The only way these attacks are going to stop is if we fight against these absurd happenings. Enough sitting back and just moaning and groaning about how terrible this is. Let's sit up, open our eyes, and realize that we need to think of ways to protect the children of our country! If you yourself say you can’t make a difference and that your opinion doesn’t matter; just think how many other people are saying that. If we would all speak up and say what we want, we can make a huge difference. This past week has felt like spring again. This saturday the temperatures are supposed to get up to 50 degrees. But don’t let the nice weather fool you. On Sunday night it is supposed to start raining, changing into sleet, and finally changing into snow early Monday morning. The forecast says it will snow most of the day Monday and snow will accumulate up to six inches by the end of the storm. On February 27, I finished my high school basketball career. While I wish that we could’ve made it further into the playoffs this year, I am thankful for the season and my career as a whole. My career certainly was not the best or even great for that matter. I didn’t score a thousand points. I didn’t ever make a deep playoff run. I didn’t end my career with a great game. There were a lot of things I should’ve done differently, and there were a lot of times where I sinned on the basketball court. Though my career wasn’t perfect and I didn’t act perfectly (or even close to perfect), God graciously allowed me to play the sport. He allowed me to see the value of teamwork and hard work. He allowed me to enjoy friendship, comradery, and competition. Hopefully, it allowed me to grow as a Christian. I’m thankful that through all I do, God is always molding and shaping me, even through something as trivial as a high school basketball career. Starting on February 20, Dakota Christian made some changes to the Cell Phone Policy. The policy use to be no phones during school hours, but technology is advancing in our world today. Now, there are so many different ways computers and phones can be used to benefit our learning. Our phone policy has changed to adapt to our advancing world. We can now use phones only when given permission by teachers and only for school related uses during class. This change can help many students and teachers to be more productive. Schools are often thought of as places where we learn and have extracurricular activities. When thinking of these activities, basketball, football, volleyball, and track are often the first that come to mind. Out of nowhere a new and adventurous sport has been brought to me by an awesome teacher. She recently has suggested dirt track racing to me. Without her knowledge, I have actually always wanted to race but never thought possible. Looking deeper into it I have come to realize that it is possible and is a very easy and fun thing. I hope to mimic the footsteps of some of my relatives and drag race someday. Some people say that it is very dangerous, and I agree, but it’s a chance that I am willing to take. Something I really appreciate about the CRC is our strong creedal and confessional background. The CRC has three creeds- the Athanasian Creed, the Nicene Creed, and the Apostles’ Creed- and three confessions- the Belgic Confession, the Heidelberg Catechism, and the Canons of Dort. Some churches say that they do not need creeds and confessions because all they need is the Bible; I disagree with these churches. The creeds and confessions both point to the Bible, not take away from it. The creeds serve to hold Christians together and point out the core tenants of the faith. The confessions serve to be road maps of the Bible. To borrow from a book by Kevin Deyoung called The Good News We Almost Forgot, it is much easier to explore America with a map than wandering around blindly on foot. Confessions are tools to help understand the Bible; they point us to overarching themes and truths found in the Bible. As more and more false doctrine circulates, it is crucial that we stand firm in Biblical Truth which means holding to age-old creeds and confessions. The NBA season is at the halfway point. The Celtics and the Warriors are on the top of their respective divisions. I have the Warriors pegged to win the championship again- nobody can beat them in a seven game series. Some top storylines so far are the season-ending injuries of two big stars (the Celtic’s Gordon Hayward and the Pelican’s Demarcus Cousins), the trade of Blake Griffin to the Pistons, the Cavaliers struggle as a team, and the tension and strife between referees and players. There have been a lot of technicals this season, so hopefully the players and referees can come to terms with their disagreements. It’s been a fun NBA season so far, and I am excited to see what the playoffs bring. In a world of rapid technological advancement, it is hard to keep up with all the new technology. There is a lot of different TV technology. Some of the newest technology are things like 4k, OLED, and curved screens. 4k refers to the amount of pixels on the screen; a 4k screen has 4 times as many pixels as a regular HD screen. More pixels on the screen means a much clearer picture. OLED refers to the kind of technology used to light the screen. OLED TVs are very expensive; most TVs are LCD TVs. The difference between OLED and LCD is that on an OLED TV, each individual pixel lights up itself instead of the whole screen being backlight as on an LCD. OLED TVs have much better black levels and white levels. Curved TVs are shaped in a curve. Out of the three new technologies I have talked about, curved TVs are the most useless. Combining 4k and OLED in one TV makes for a gorgeous picture. Our world is a fast-moving place; you should carefully research when buying new technology. Spring? Or Just a Winter Warmup? A bitter, cold Martin Luther King day started off a new week. After temperatures of 5 below on Monday, the week warmed up to the upper forties and mid fifties. The warm temperatures are great and make it feel like spring is right around the corner, but snow is on the way. The South Dakota winter is soon to return on Sunday with another snowstorm. We are expecting to get three to eight inches of snow. It’s just another brutal South Dakota winter! On Thursday, January 11th, the snowstorm caused a late start. When there is a late start the students’ schedule changes. All of the classes change to shorter increments. This is done so that all the classes still have time together. Due to the short class periods, teachers don’t get much time to get any work done. Some students say that when there is a late start two classes should be dropped so that the teachers have enough time with their student to accomplish a normal day of work. A schedule change would make the day more simple and more work would get done. This year I have had the privilege of taking Pre-Calculus with Luke and Mr. Mitchell. It has been one of the hardest classes I have taken in all of high school, but it is extremely satisfying working out a complex problem and coming out with a (hopefully) correct answer. Along with learning mathematical concepts like De Moivre's theorem, Luke and I have also gotten to soak up some pop culture knowledge, sports opinions, and, every so often, wisdom from Mr. Mitchell. It’s a lot of fun being able to talk and learn with those two men. I’m grateful that I can connect with someone my age and someone a little bit older and wiser. I’m sure that class is something I will remember fondly for years to come. Over Christmas break and New Year’s, winter finally set in. After getting about three inches of snow on the 30th, it got extremely cold. On the morning of New Year's, temperatures reached down to 35 degrees below zero! What a great way to start off a new year. With last year being the 500th anniversary of the Reformation, the five solas were probably preached a lot in Reformed churches. I know that I heard a lot about the solas last year, and it got easy to get sick of hearing about them or think I knew everything about them. Even though I heard about them a lot, I will never fully understand or appreciate the five solas. Holding to the Truth that Scripture alone is sufficient to tell us we are saved by Grace alone, through faith alone, by Christ alone, for God's glory alone, is very important because it gets to the core of the Christian faith. It would do us well to ponder the free and endless love that God has for us through studying and meditating upon the five solas. DCS had their Preschool through 12th grade Christmas concert last Thursday, December 7th. The concert featured the high school choir, high school band, grade school choir and grade school band. The 3rd through 6th graders put on skits and read lines explaining the colors of Christmas. The Christmas program was an excellent representation of some of the talents the Dakota Christian students possess. The first snow storm struck on December 4th and caused a few problems. Most kids and staff made it out of school in time, but some were not as fortunate as others. Several staff members and students were stuck at school for several hours because of the treacherous conditions the weather caused. While stuck at school, the power went out for a short amount of time, but the power soon returned. When the weather calmed down and visibility was better, everyone was able to start their trek home. We thank God everyone made it home safely!